Today we continue our Christmas Treats series with a fun little snack from Bonnie at The Pin Junkie. This one is a mix of salty and sweet and if you’ve never tried it, you really should! Hi! I’m Bonnie, The Pin Junkie and I write about the recipes, crafts, and home improvement projects I do that are inspired by Pinterest. I’m so happy to be guest posting for Jerri today! I wanted to share with you a super simple and delicious holiday treat. 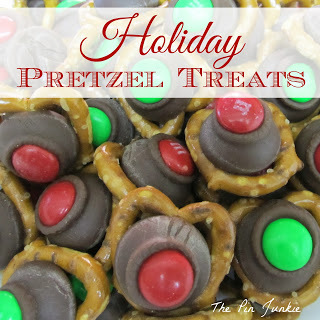 These holiday pretzel treats are nice to have on hand when guests drop by and they also make great gifts. 1. Heat oven to 175 degrees. 2. Lay the pretzels on a cookie sheet. 3. Place an unwrapped Hershey’s kiss on each pretzel. 4. Place the pretzels and kisses in the oven for about five minutes, just long enough to soften the Hershey’s kisses. 5. Remove the cookie sheet from the oven and while the Hershey’s kisses are still warm, place an M&M on each kiss. 6. Allow to cool on the cookie sheet. You can place the cookie sheet in the refrigerator for faster cooling. I hope you’ll give this recipe a try. The combination of sweet and salty is irresistible! Be sure to stop by The Pin Junkie for more great recipes and craft ideas. You can also follow me on Pinterest and Facebook. Thanks so much to Bonnie for being here today! Please be sure and visit her over at The Pin Junkie!